All these should be audible in stereo in all parts of the apartment including balcony and bathroom. Not everywhere at the same time though and not necessarily in high-end quality. This had been on my wish list for many years, but I was too lazy to lay cables through the whole apartment (especially through doors, which should be lockable). And since there are lots of signal paths, the result would have been a bit messy. Dedicated wireless audio solutions didn't really convince me, since they are mostly proprietary technology. I never want to become a victim of Vendor lock-in (especially not at home). Ubuntu 8.04 uses PulseAudio as the sound server, while ices2 only supports Alsa. Recording from an Alsa hardware device while PulseAudio is running doesn't work. For grabbing the audio from a running gmerlin player the soundcard and driver need to support loopback (i.e. record what's played back). This is the case for the Audigy soundcard in the Media PC, but not for the onboard soundcard in the desktop machine. The Alsa devices to be written into the ices2 configuration files are called pulse and pulsemon. The device line is hardware dependent. Use the PulseAudio Manager (section Devices) to find out the corresponding name for your card. If your card and driver support loopback, the pulsemon device isn't necessary. Some fine-tuning can be done regarding encoding bitrate, buffer sizes and timeouts. 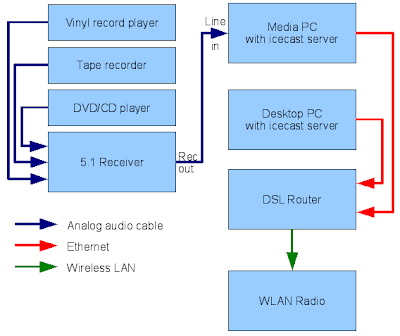 When I optimized everything for low latency, icecast considered the WLAN radio too slow and disconnected it. More conservative settings work better. Encoding quality is always 10 (maximum), the corresponding bitrate is around 500 kbit/s.